Angus Fire’s Fetch system is especially designed to transport and deploy Duraline Hi-Vol efficiently. Hose is loaded into flaking boxes that can carry up to 2 km of Duraline Hi-Vol. This method of transporting hose offers a low cost and simple deployment technique. The hose is simply drawn out of the boxes and lowered on to the ground. The Fetch System is suitable for hoses up to 152mm (6″) diameter. The Fetch System enables fire crews to bring Duraline Hi-Vol back into storage after an incident with the minimum of physical effort (a single coil of 5 inch Duraline Hi-Vol can weigh 50 kg). It avoids the risk of injuries and fatigue during emergencies and training exercises and so complies with Manual Handling Regulations. Fetch comprises a simple but cleverly designed twin-drum friction system with very few moving parts for maximum cost effectiveness and reliability in an emergency. The mechanism is driven by an independent hydraulic power pack. As an option it can be driven by a Power Take Off PTO on the vehicle. 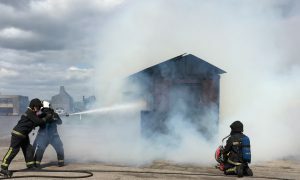 For other retrieval solutions for large diameter hoses place contact Angus Fire.